Melons are yummy. They are very juicy and we like eating them after Mummy has finished with them. There are three types we like and at least two we don’t. I think the ones we like are called Galia, canteloupe and Charentais. We don’t like Honeydew or watermelon. There is an art to eating a melon. Firstly your slave has to prepare it properly. Fred and George started the tradition whereby the slave has to test the melon before giving it to you. They cut the melon in half crossways, then scoop out the seeds. Then they should spoon a generous layer of the flesh into a bowl for themselves, leaving some flesh and the skin for you. I forgot to get them to wash the melon before cutting it open. Once the melon is ready for you, it has to be cut into portions properly. If you are going to share it with a loved one or best buddy, and you are really greedy or your slave is going to be away for a night or two, then you can have a half a melon. Fred and George used to do this regularly. 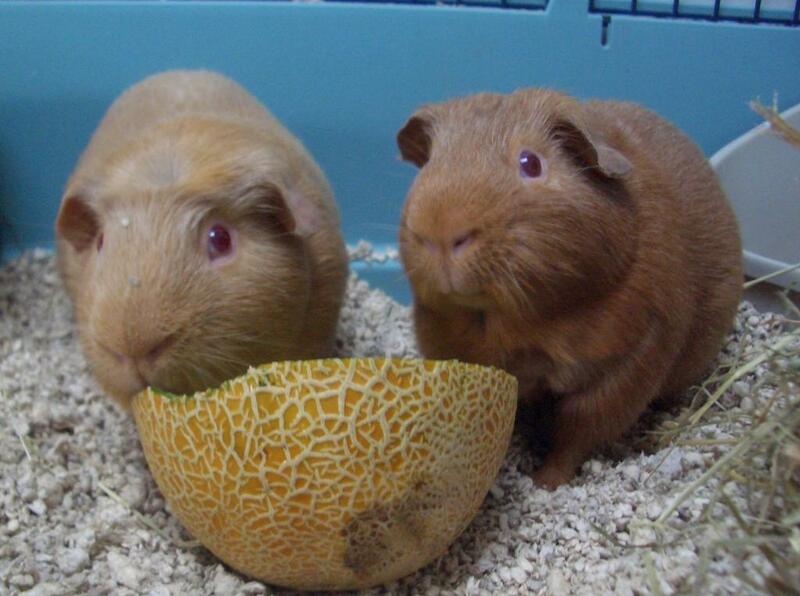 Most of the time you will have to share the melon out between you. Your slave should prepare a slice, so that you can drag it away and eat it all by yourself. The correct way to eat this slice is from the end. Humphrey insists that you should eat all along the side from one tip to the other, then work your way back again, till it is all gone. It does sound fun, I must admit. I usually share your food preferences, Vic, but I have to say that I don't like melon. That's ok — diversity among friends just makes life more interesting, don't you think? Saku loves watermelon, and by "loves" I mean slurps up at the speed of light. Willoughby creates a little drama about watermelon: "Omg, what is that?! Should I eat it?," etc. That's our Willoughby. They haven't had any other type of melon. Bless you my furry little friend, Geoff. No we don’t go for walks on a leash. Those harness things they sell in shops don’t really work for piggies. We are likely to hurt ourselves as we have delicate bones. There is a danger they might hurt our spines and ribs. We go for holidays though. We visit all sorts of places. You can read about them in “Tales from the Hutch”. We also run around the garden doing our lawn-mowing duties. We are very good at lawn-mowing. I hope your giraffes and hippothingies are doing well. I bet you’re going to do Z for Zebra. We have a nice zebra-striped snuggle-sac. My mate Hugo won a photo competition with it as it’s his camouflage sac. There’s bound to be a copy of him in it somewhere on here. Maybe in Hugo-A Life. Bye now. See you soon! This makes me miss my hamster. She really liked watermelon. Aw, I’m sorry you miss your hamster. I’ve never met a hamster but some of our friends have. They say they are small and have squeaky voices. Thank you for visiting us, Mistress Kimberlee. I must visit you back.